I was playing with the neat Google search screen for a while today and I couldn’t for the life of me come up with a design. 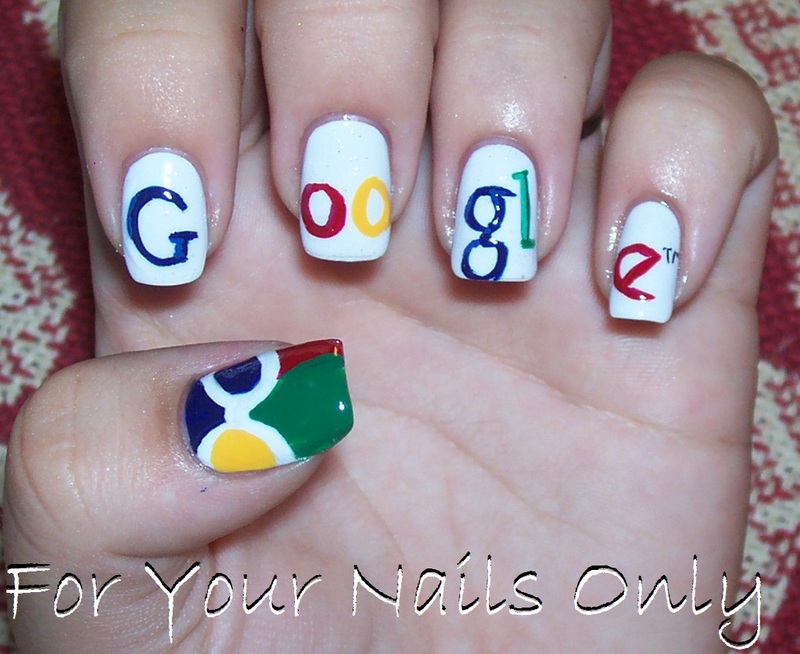 I decided to open up my browser, click on a random bookmark with my eyes closed, and that is what I would do for my nails. Go figure, I missed the bookmark bar and it stayed on the search window. That’s when it hit me, sometimes, what you’re searching for is right in front of you! For this manicure, I used one coat of OPI’s Natural Nail Base Coat and two coats of Sally Hansen Lavender Cloud as a base (sorry for any bubbles, I dropped the polish right before painting). I then used Orly La Playa for blue, Essie A-List for red, OPI’s The It Color for Yellow, Icing’s Envy for green, and Wet N Wild Black Creme for the “TM” finally topping off with two coats Seche Vite. This is a fun one! Hopefully, you found what you were looking for by checking out my nail art- your daily dose of creativity!!! This entry was posted in Nail Art and tagged blue, creme, Essie, green, Icing, OPI, Orly, red, Sally Hansen, Seche Vite, Wet N Wild, white, yellow by Tara. Bookmark the permalink. Wow, looks so neat! You must have the steadiest hands in the world! aw thank you! I dunno, I should send it over and see what they think! Very clever and so nicely done! You never cease to amaze me with your art and creativity! Heyyy girl you are the best ! :) its so creative!!! I love to read ur lovely blpg everyday!! thanks everyone- I'm glad you like it. I'm hoping to have this used as a google fan logo for a day(thanks Kimberly! )- if you like it feel free to spread the word- the more people who comment, the better chance they'll use it. And thank you for all of the kind words, you all make me blush!! ha ha google nails! luv em!